The District Council of Dublin decided on the 30th December 1876 that a cemetery be "laid out". In December 1878 the renumeration of the Curator was 7 pounds and fifteen shillings for each quarter of the year.The next year on the 4th August 1879 a recommendation was made that trees be planted in the cemetery grounds. 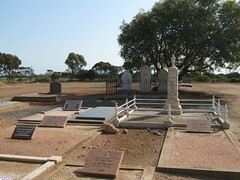 Mr.Carrier was the appointed curator in October 1887 and the costs for grave digging was 1 pound for adults and fifteen shillings for children under 12 years of age. In January 1892 Mr Percy Huxtable was the curator and his payment was 2 pound 10 shillings each month. 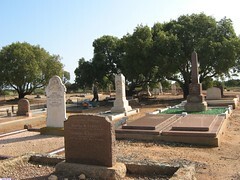 In 2003 a Memorial Wall was erected for the interment of ashes. 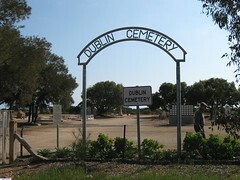 The name "DUBLIN CEMETERY"was built by the business Bassett Welding & Fabrication, Lewiston and installed 2005. Do you remember Dublin Cemetery ? Then Join up and add your memory here.